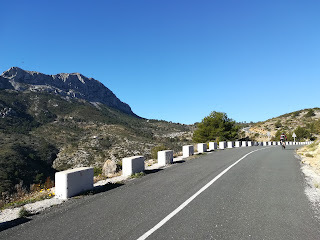 After the spectacular ride over the Coll des Rates and Puerto de Sa Creueta the day before, we were very grateful for a personal recommendation from a fellow motorhomer to try this particular loop right out of Xalo. As with any loop, we could have done it either way, but our friend recommended clockwise so we got to enjoy a short 7-km or so warm up along the main road (CV-750) heading east towards Benissa before the real climbing of the day began. Well, I say ‘warm up’. In the interests of accuracy I should probably add that the road between Xalo and Benissa includes at least a 100-metre ascent and is generally rolling, but with a chill in the morning air we didn’t mind too much. 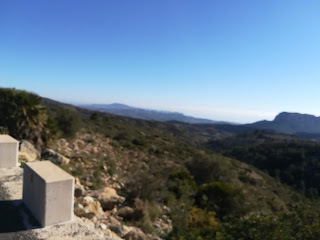 Anyway, at Benissa we turned right onto the minor road signposted “Pinos” and soon passed a sign with the facts of the climb up to “Puerto de Bernia”: The top was 15.2 km away with an average gradient of just 2.7%, however, that included quite a lot of flat bits and a final 5-km which involved 12%, 17% and 14% maximum gradients! 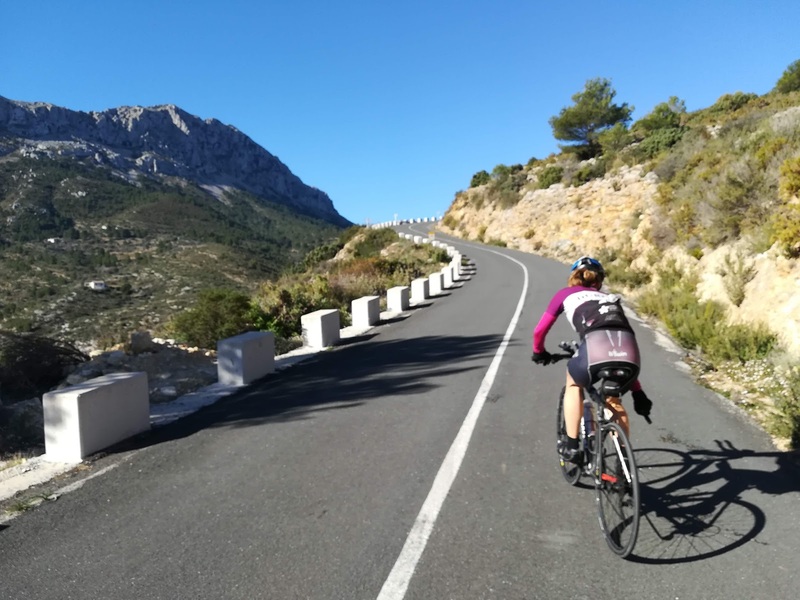 After a short opening climb we were soon snaking our way along the gentlest part of the road, through pine forests and enjoying a magnificent view across the hills to the sea at Calpe until we reached the chunky part of the slope. As usual, we were in no particular hurry, but 17% is 17% whichever way you look at it. Beneath a now hot morning sun we were soon dripping with exertion as we ground our way up the slope, but it was soon over and as the view opened out over the tall cliff-faces of the Sierra Bernia ridge we were even more delighted that this route had been recommended to us. After the summit at 620-metres, we zigged and zagged downhill into Xalo to complete a loop of a little under 40 kilometres. The descent was different, but no less stunning with countless almond groves coming into blossom and lovely views north over the plains towards the sea. Definitely a loop we’d like to do again and possibly the other way around, so climbing straight out of Xalo.